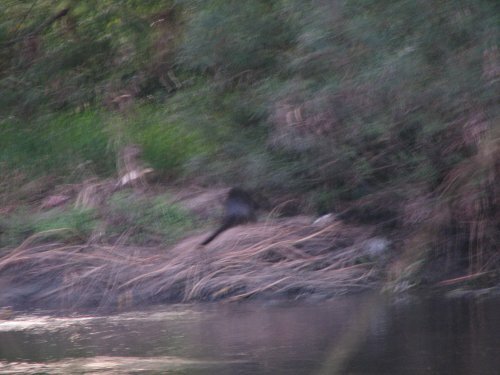 For some unknown reason I ventured forth last Sunday afternoon to fish a river that was as clear as I expected it to be, and the only activity between dusk and midnight was from rats running around my feet. 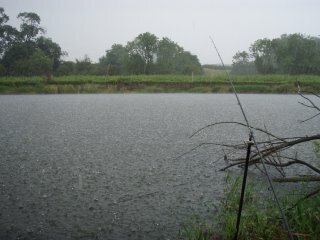 But despite the weather continuing hot and bright I just had to get out on Wednesday, and decided to fish Thursday too. Quite what drove me on I'm not sure, but it was one of those things where I get my gear ready almost in a daze, and there's no stopping me. It was a good moon phase too - first quarter. While I am confident I can catch barbel any day, the fishing around the first and last quarters of the moon might just be a little easier. If I get 'that feeling' and the moon phase is right, I have to go for it. The Trent seemed to be carrying a touch of colour, enough to give me confidence in daylight, but it was gone five in the evening, with the sun beating down, before I got some feed out and a bait in the water, in the swim that had considered too swirly last time I was down there. Within half an hour I had my first fish on the bank, a hard scrapping nine pounder. The next time the rod tried to leap off the rest the culprit proved to be a chub of around three pounds, followed by a bream a little larger not long after. All the action was coming to the downstream rod fished just off an overhanging willow, although the upstream bait was positioned on a nice crease it remained untouched. 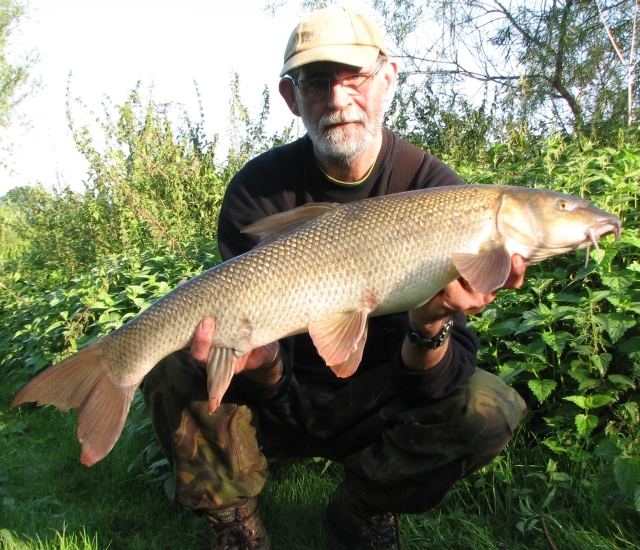 Around seven the boilie was away again and a barbel of four or five pounds was soon being unhooked in the margins. Three quarters of an hour later I was weighing an eight pounder, but by now the sky had clouded over and the strong northerly wind was making it feel a lot colder than it really was. By nine o'clock I was considering packing up, but erected the brolly instead. With the wind deflected it became bearable and I stuck it out netting a seven pounder at half-nine. At 10.30 I decided I'd had enough and headed or a secluded spot to get my head down in the back of the car. 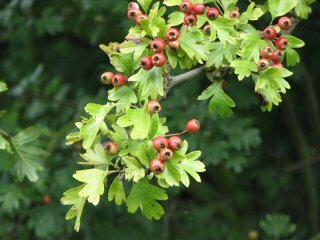 Although it's not quite the end of August the berries have been on the hawthorn for a while now, and some leaves are starting to turn despite the lack of a midsummer heatwave. When I got up shortly after dawn there was a definite hint of autumn in the air. I boiled up the kettle to refill my flask, ate a Mars bar to give me some energy and was fishing by six in the burdock swim. Amazingly, only thirty minutes after putting in a mix of hemp, pigeon conditioner, sweetcorn and pellets the boilie on the downstream rod was away and I was hanging on to something that was taking line. I knew I had no option but to clamp down because of the fallen willow. There was a grating sensation then the line went slack. I was convinced the line had parted, but it hadn't. The fish had just come adrift. I checked the hooklink and replaced the damaged upper section. 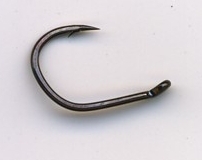 I use a two part hooklink with a swivel a few inches from the hook for this reason - among others. A bit more feed went in and a fresh bait was cast out. I was not over confident of any immediate action, and sat back to watch the sun rising in the sky warming the day up before the wind from yesterday returned. At five past eight history repeated itself, and on autopilot I found myself standing up holding on to a rod bent right round to its full curve while a barbel took line from the reel. This time the fish kited out into the river away from danger so I was able to ease up on it a bit, and after a bit of a tussle it was resting in the folds of the net's mesh. I took some comfort from the fact that it didn't look huge, as it had fought with the same power as the one I'd lost earlier, meaning I hadn't lost a biggie. Lifting it up the bank in the net it felt, and looked bigger than I'd first imagined, and the needle went past the ten pound mark on the dial of the scales. Had I missed out on a brace of doubles? Not to worry, it still meant that I had achieved one of my targets for the season, an August double - the one remaining month of the season I had failed to catch a barbel of that weight. I had a few options open to me now. Stay in the burdock swim until after dark, which might produce but could prove tedious and would teach me nothing about the river, or go look elsewhere. I decided on plan B. Packing the gear away at noon, by which time the wind had picked up again, I went back to the car, made a fresh flask of tea and had something hot for lunch before driving off to look for a new swim. To be honest I almost went back to the burdock swim as what I found was not all that promising, but I set up above a weed raft and soon started getting a few chub knocks. However, I wasn't happy, and after a while moved below the tree and fished the crease downstream. Albeit with little confidence. 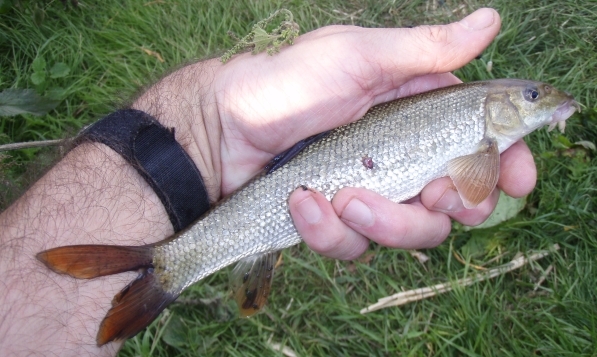 Why Trent chub imitate barbel bites and Ribble chub rarely do I haven't a clue, but for a brief moment just before five thirty I thought I had hooked a small barbel. This turned out to be a chub of 4lb 11oz. I also caught a couple more chub on the boilie rod, one of which might have made six ounces, and the other maybe half that again! Come nine o'clock I'd had enough. The swim had no barbel magic and I decided I might as well head home and get a reasonably early night. The forecast had been for rain early, clearing in the afternoon, and I set off for the Trent as the morning showers subsided. Travelling south I passed through a few brief showers, but the sun was soon burning down on dry roads. On arriving I could see the river was up, but not quite as much as I had hoped, maybe a foot, but it was carrying a decent amount of colour. However, it was still high enough to make my first choice swim look a bit too pacey. Going further downstream a swim that had looked a bit dull and uninviting on Sunday now seemed perfect. 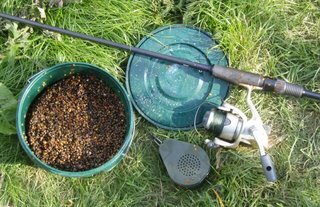 So I put half a dozen droppers of chilli hemp, garlic luncheon meat and pellets downstream on the crease where it passed some trailing willow branches. Then I sat back debating whether to remove my sweatshirt or not as it was getting pretty warm. The trouble with reviewing bait is there's no real way of knowing if it makes any difference. But at least I had now thrown all the hemp away and only had two more cans of meat to get rid of! 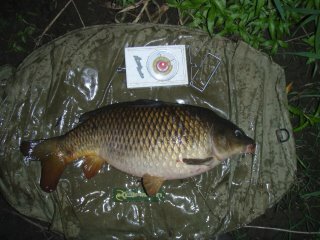 A boilie went upstream on the edge of the crease, and a large piece of meat went on the feed. The plan was to give the swim an hour or two, then move. I was rebaiting the boilie rod after half an hour when the other one lurched sideways, swivelling on the rod rest, and the line went slack. Drat. I put this down to an over ambitious chub and carried on with the task in hand, from which I was disturbed by the sound of a baitrunner. 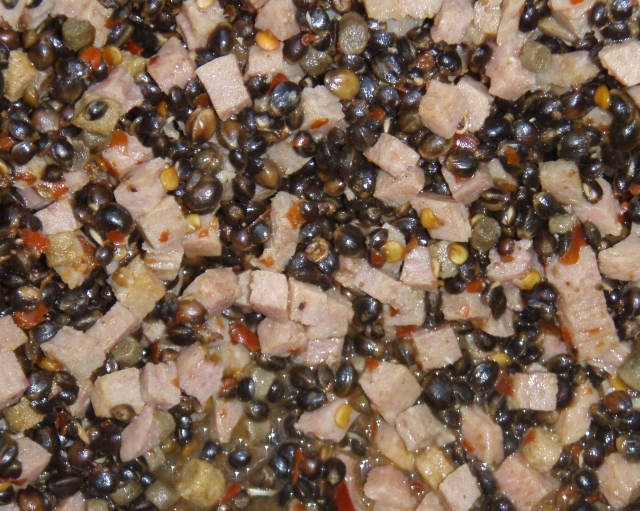 Maybe there was something in this hemp and meat after all? Unfortunately I failed to hook the fish, I think because the hook was tangled - it certainly was when I wound in. This incident decided me to stick it out. There had to be more fish around, and dusk would be a prime time in a swim like this. Not long after sorting out the meat rod my musings about removing clothing were decided for me. The sun disappeared, the temperature dropped and rain began to fall. Then it poured down! The thunder that accompanied this downpour was some of the loudest, and closest, I have ever heard! I was sure a fish would take and force me out from the shelter, such as it was, of my brolly. But it was not to be. It was not to be for some hours that a fish showed any more interest. The rain stopped, the sun shone again and the rest of the afternoon was lovely. I took the opportunity to have a wander round, but nowhere else took my fancy. I'd stick it where I was until after dark. Whoever said that carp, river carp even, fight harder than barbel (pound for pound) must have been an idiot. I've had a few on barbel tackle now, to fifteen pounds odd, and not one of them has been a match for an eight pound barbel. That c**p knocked my confidence a bit, the barbely feeling the swim had exuded initially had gone, and it wasn't long before I packed up. I just had to get away from working yesterday. So I loaded up the gear and decided to go check out the upper Trent for a change. It would have been easy to have dropped in the first spot I looked at as it was quite appealing, the second stretch had a couple of even better looking spots but after a while sussing the third length one swim simply had to be fished. Best of all the swim was tucked away in some undergrowth. Out went a few droppers of Dynamite Frenzied Chilli Hemp (which I was using as I am supposed to be writing a review of it) and some more of mixed pellets. The dropper rod in the photo is a fairly stiff six foot thing I knocked up specially for the job (built on a prototype lure blank that wasn't quite right) and the reel a robust Shimano with a decent grip on the handle for cranking the biggest dropper back against the flow. After putting the obligatory boilie and bag of pellets downstream above the overhanging willow I rigged up a second rod with a maggot feeder to fish upstream for a change. Who says I'm not versatile? A size ten Kamasan Animal tied to 20lb braid and crammed with half a dozen maggots being the subtle end rig. On the second cast I had my first upper Trent barbel in my hand. 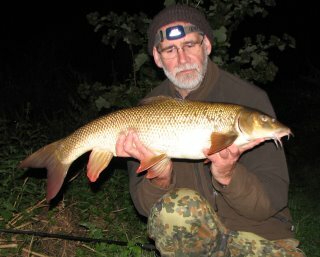 I hadn't blanked, and I'd caught a barbel! The maggots were getting plenty of attention and if I'd fished more appropriately for them I reckon a decent bag of chub and dace, and maybe more baby barbel, could have been put together. As it was a chublet and a dace managed to get hooked. When the heat started to go from the sun I swapped the feeder rig over to a straight leger with an 11mm Sonu S-Pellet (also free) on the hair. These pellets have a good oil leakage, are easily hair rigged, but are prone to disappearing from the hook - either for no apparent reason, or because they have been nibbled away by small fish. However I do like the smaller ones for adding to my bags of pellets that go on the hook and would buy them for that purpose if I had to. About a third or a quarter of the bag's contents being S-Pellets and the rest hard pellets. In fact they are the 'magic beans' I was using in PVA bags when I was tench fishing in the spring! Anyway, it wasn't long before something headed downstream with my S-Pellet. A barbel of four or five pounds, actually. But still the downstream rod tip, in the prime spot, remained inactive apart from indicating odd bits of weed and debris brushing the line. After dark, when the tip stopped being inactive there was no mistaking it. The rod lurched over, the bankstick fell sideways and the Baitrunner screeched! Assuming this was the result of a barbel making off with my boilie I picked up the rod and leaned into the culprit. A short but hectic fight saw a decent fish dive into my waiting net. Leaving the fish there in the water I set up the camera, got the sling and scales ready and then lifted it ashore. Not a double, but a nice fish for a first session on a stretch nonetheless. The burdock reference? That's the plant that forms my leafy halo!